My Legends of Localizaton work involves a lot of research, so I regularly find myself digging through old magazines, old videos, auction sites, and the like for information. I’m always coming across unrelated but super-interesting info, so I thought it’d be nice to start sharing some of that here on the site. 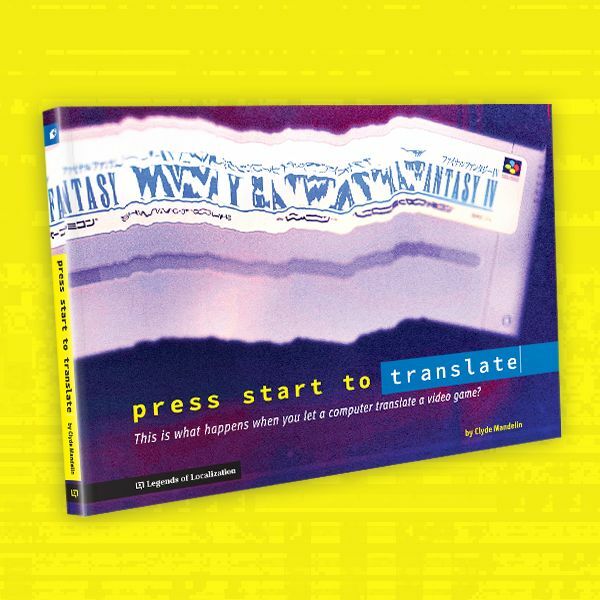 Even if it doesn’t seem related to localization at first glance, a game’s history does often connect to its localization in interesting ways. So with that in mind I’m hoping to share various small findings once in a while, eventually in its own separate section. 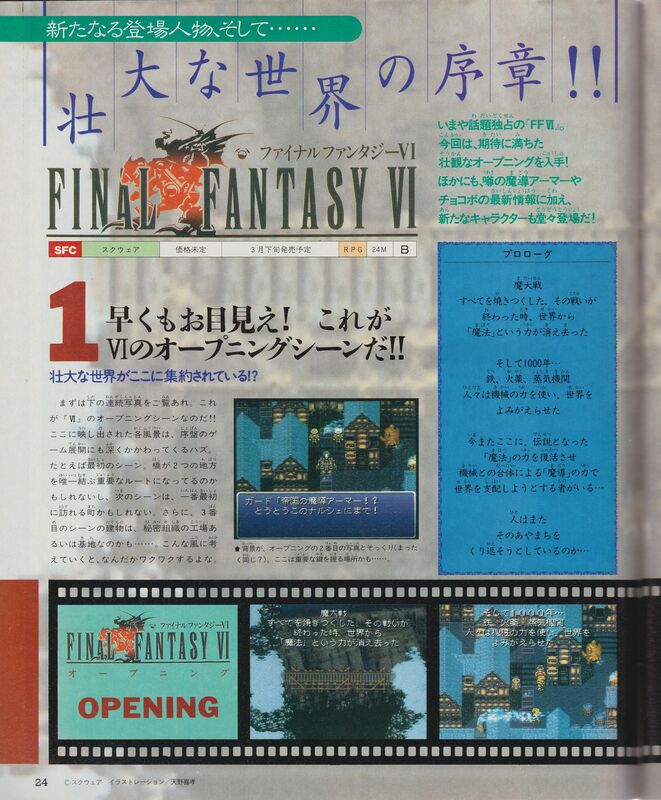 To start off, here’s a neat little preview of Final Fantasy VI that I came across in a February 1994 issue of Marukatsu Super Famicom, a really great magazine that’s almost unknown outside of Japan. This was a few months before the game’s release in Japan, so it’s interesting to see what changed at the last minute. And for convenience, here are the same images (in higher quality) in a handy PDF file. By the way, feel free to share this content or post this anywhere – if you could credit Legends of Localization and/or link back to this article that’d be nice too! Anyway, I’ve only skimmed the article but a few interesting things popped out. Narshe’s inn appears to have also featured a pub sign. One of the images of the game’s introduction has slightly different text from the final version. Now, once more, there are some who intend to rule the world by reviving the power of this legendary “magic” and combining it with machinery to create a force known as “Magitek”. Now, once more, there are some who intend to revive the power of this legendary “magic” and use its tremendous military might to rule the world. So it appears this introduction was meant to introduce Magitek and explain its origin. 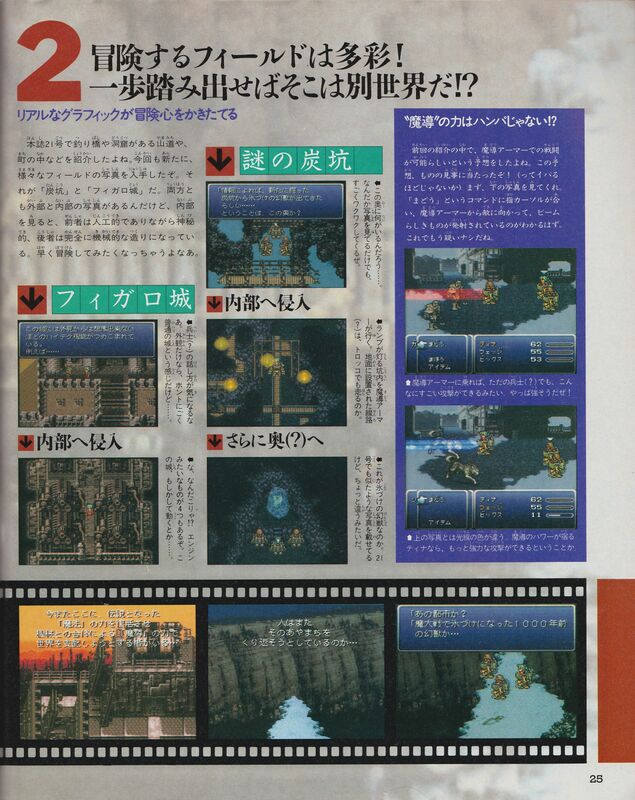 I should note that the Japanese text in the first screenshot uses the word “madou”, which is what we know as Magitek. Some of the battles shown in the preview don’t happen normally in the final game. More interestingly, the desert battle background looks very different. I’m guessing the original desert background didn’t have the wavy special effects, but then someone thought of it at the last second and put it in the game instead. I noticed this same background in the next issue or two of this magazine as well. Also, it appears Terra has her Morph ability here, which seems unusual to see in this context but probably isn’t impossible. It looks like Narshe was going to have a chocobo stable early on. The final version doesn’t feature one at all. What a strange thing to change so close to the game’s release. Anyway, that’s my little contribution for Final Fantasy fans and game historians out there. It’s very likely this is already all known and well-documented, but I thought it’d be nice to share it in my own way here. You know, I wonder if any data relating to any of this still exists in the final Japanese game. I’m always on the lookout for info about games and game history, here are some ways you can help! 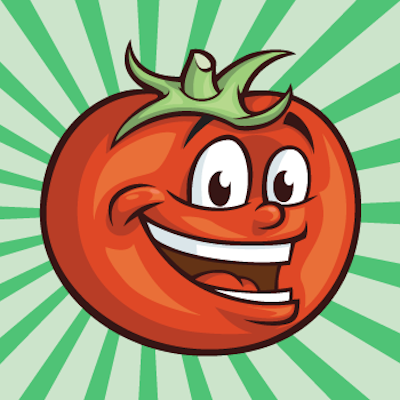 If you come across any news in mainstream media about games (in any language, in any country), let me know! This info is always interesting and helpful for my articles and books. Everything from stories about game-related political controversies to goofy reporters not understanding games, anything is good! If you own or ever come across any game magazines or game-related materials that you don’t want, let me know. I’m especially looking for Japanese magazines, European magazines, and anything that wasn’t necessarily published in the U.S. If you come across any game-related scans or videos that you think I’d be interested in, let me know. I’ll continue to share interesting findings here on the Legends of Localization site, although I still haven’t come up with a good name for a new section for it. If you can think of any good section names let me know in the comments. Also let me know if you notice anything else in these scans that I’ve missed! Huh, Locke doesn’t show up in any of the parts he’s supposed to. If this was only a few months before release, it might only be because they wanted to keep characters a surprise for the final release, but that’s still odd to me. The very small houses seen in the background at the bottom of the cliff in the intro looks slightly different to me, red rooftops instead of purple but it may just be the magazine playing tricks with the colors. 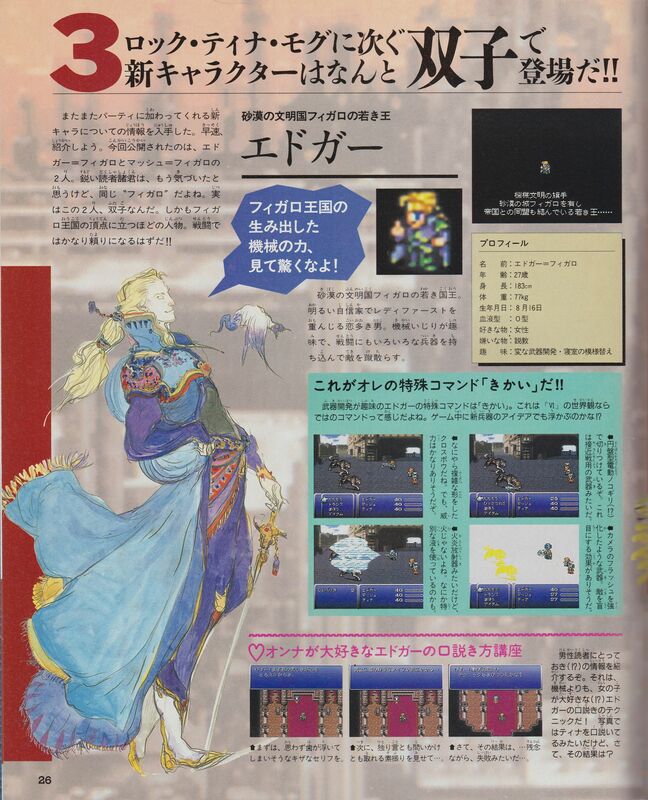 Maduin may have either been a placeholder or more likely the plan was to have Terra’s father explain her origins via contact with her after the Kefka battle in Narshe. They likely nixed it because they wanted it to be more of a surprise as to who her father was (and the fact humans and Espers can actually mate together), hence putting Valigarmanda in as the Esper who would awaken her power. I’m a huge dork, but in terms of names for this section of the site, I can’t get ol’ reliable “Unearthed Arcana” out of my head. Perhaps something along those lines? Buried Treasures? Game Archaeology? Maybe the chocobo stable was removed when the programmers suddenly remembered that they never gave Banon a chocobo-riding sprite. Granted, that would mean they still forgot the hidden stable near Figaro Castle, but it’s the best explanation I can think of. It’s a possibility. To my mind, it seems more likely that they took it out to force the player to have random encounters on the road to Figaro, and learn how to play Terra and Locke before getting into a relatively tough inescapable battle. Otherwise, the player could take the chocobo to Figaro, save after the party splits, and never actually have a normal encounter before the back-attack M-Tek Armors. The reason you give is very likely, things like telegrams and military messages were historically often entirely in katakana. I’m not sure why it was changed in later games but it could just be simply a case of it getting annoying after a while or trying to make the gameplay experience as smooth as possible for players. 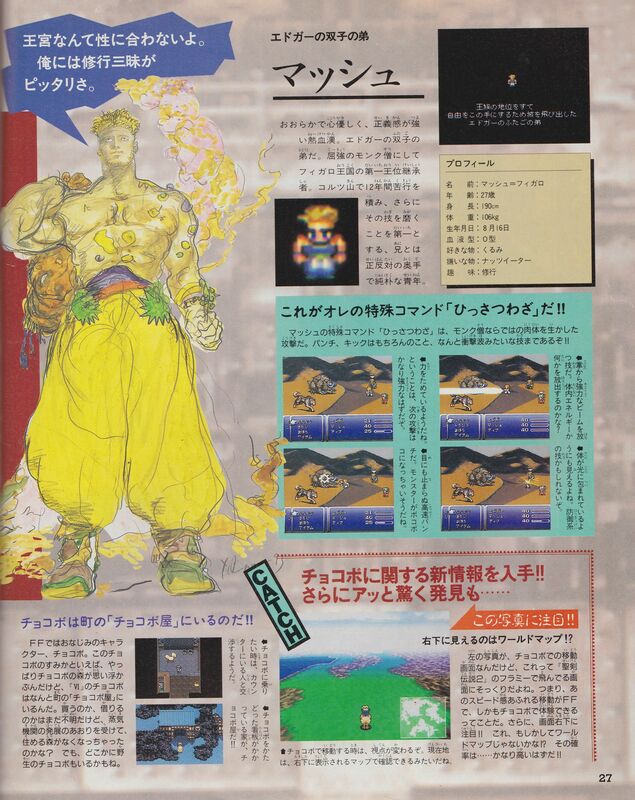 I think Sabin’s overworld sprite is slightly different too. Same with the Figaro soldiers. Oh man, it’s been ages since I’ve seen those pre-release screenshots… Quite a bit subtly changed visually by the time the game launched, including the soldier sprites (both Narche and Figaro variants) and the detailing on the world map tileset. Less obvious is how much the script changed, however. Having actually extracted the release version’s script and translated the whole thing, I can tell you that the differences in these screenshots are no surprise. The game’s script file is an absolute mess, with multiple drafts of several scenes present in some sections. I suspect that the game was more than a bit rushed for release at the end of the development cycle, as usually they don’t leave unused drafts of scenes in the game (it’s a complete waste of memory to do so, after all). That’s kind of exciting to hear, I’ve never really dug around in any of the ROMs but if it’s anything like EarthBound I bet people are still discovering things in the data 20 years later. One other thing I happened to notice that you may have missed is that in the screenshots with Biggs and Wedge alongside Terra fighting in Narshe, Terra has her name, where in the final releases she doesn’t have a name (It just shows as ???) until after the cutscene with the Esper in the caves. Ah, excellent catch. I remember looking at her name there and thinking “I know something’s up here” but the ??? didn’t occur to me. It’s always intriguing to see what gets changed or touched up before a game’s final release. Betas are often full of neat placeholders and assets that get usually get dropped or overwritten by something else when the game goes retail. No idea if you’ll even see this, but I noticed that the text in the intro is word for word the same as the text on the back of the box (over the train, 4th and 5th lines). Maybe it was placeholder text until they finalized the in-game script. Whoa, I never would’ve noticed/known that. Thanks! I swear I remember seeing a screenshot in a magazine that had Arvis/Old Man/Jun participating in a regular battle encounter scene. I’ve not yet found any other traces of this, but I remember seeing him on the right side of the screen, with “ARVIS” on the bottom next to an ATB gauge.